On a colour control setting with only three dials – black, white and beige – Misha Hollenbach somehow manages to crank out an unnervingly discordant symphony of harmonic rhythms that I could quite happily have bathed myself in for hours. Part ceremonial aftershock, part inscripted artefactualism (yeah, I made that up, what’s it to ya?! ), there was more than a flicker of temptation to strip off, light a bonfire in the middle and smear my face in handfuls of charcoal and glee. Lying on the couch as I write this, reading my scribbled notes from my visit and looking at the images as I load them into this article, it’s going to be hard to clearly recount the energy and the intensity packed into the artworks of this show. 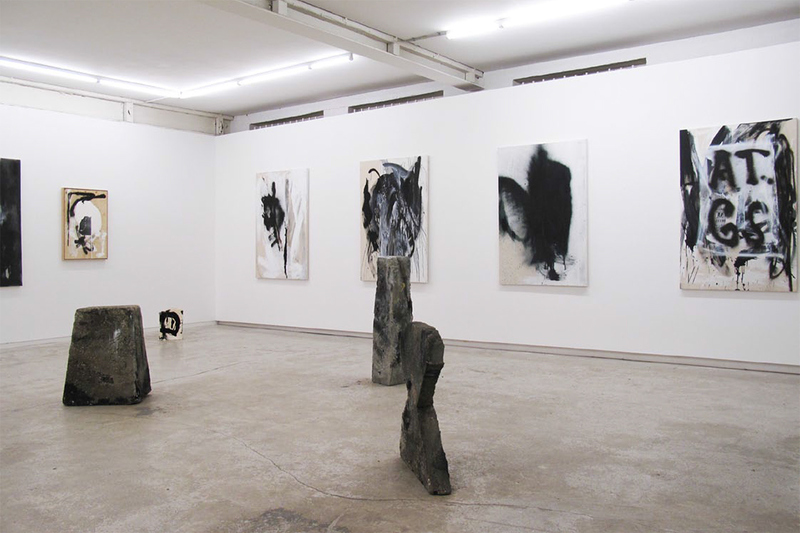 It’s going to have something to do with personal taste, of course, as I felt Christopher Wool, Aaron Curry and Albert Oehlen with me in the space. I remember borrowing a book on Oehlen and taking it to the cafe to read where I suffered through heart palpitations in excited torment and joy. Hollenbach resurrected that sensation with an urgent clambouring of haptic surface actions. Everything felt heightened by touch. Like frictional heat from the artist’s hand was still emanating from every piece. The concrete totems on the floor are born of tombstones, car park bollards and Orkney Island rune stones. Imprinted, sprayed, moulded – game pieces and position markers. Marks! Everywhere marks. Lines that trailed and lines that dripped. Lines cutting their way through plywood strips. Brush strokes, spray rays and scissor slices. Chaos surging the onward impetus while the artist clutches eagerly to the steering wheel, deftly maneuvering between the pitfalls of the abyss. There’s primitivism at play, with tribal masks and hints of the ancient and archaic. But then there’s the reflexive interplay of cross-cultural referents and a mashup of co-mingling medias. 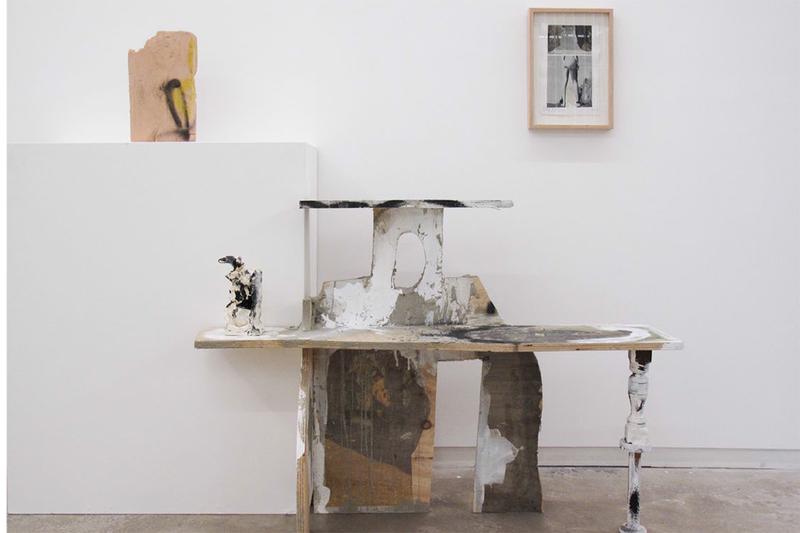 Prints slam up against paints slam up against ceramics slam up against photography. But this is slam as dance. As ritual. Collage gives way to hybridity and falls apart again to materiality. An urban tone is evident as the materials converse freely with the concrete floor, the white painted bricks and the graffitied laneway outside the window. The pieces all seem to hold themselves together with an internal logic that stabilises the frenetic vibrations of which they are made. Even the paintings, less materially componential (yeah, I made up another word, this show demands it) than the sculptures, feel like they are haptically charged and physically present. The canvas is part of the picture as much as the paint. I loved this show – it was punchy, take-no prisoners, pack-it-full-of-pith-and-vinegar kind of stuff. One of the rare times when a magazine page sticky-taped to a slathering of paint on a screen-printed semi-abstraction mounted on ply really feels justifiably articulated. You should totally check it out. Tags: Misha Hollenbach, Utopian Slumps. Bookmark the permalink.